For mice and men, a strength in one area of Darwinian fitness may mean a deficiency in another. A look at Olympic athletes shows that a wrestler is built much differently than a marathoner. It's long been supposed that strength in fighting, or protecting territory and resources, comes at the expense of running, or spatial mobility. Now an experiment with house mice provides evidence for this theory. 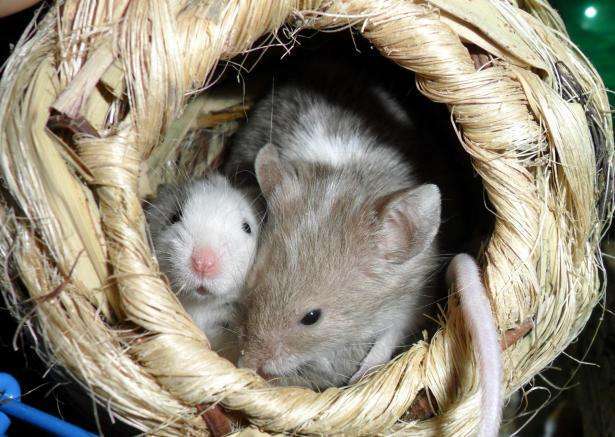 University of Utah researchers measured how successful mice in the lab were at fending off other males from a territory containing females. The mice were housed in a lab enclosure with plenty of room for the losers of fights to retreat. Before and after the enclosure experiments, the researchers also measured running efficiency of the mice on tiny treadmills to see which were the most efficient runners. Their findings: Mice that defended their territory (i.e. fought off other males) burned more oxygen while running than less-successful fighters. You might be picturing Charles Atlas huffing and puffing while running while a lean 97-lb weakling runs circles around him effortlessly, but that wasn't the case in this experiment - good fighters and good runners had about the same body mass. More subtle physiological differences between the two groups are likely at work. Humans are also creatures that employ both endurance-based and aggression-based behaviors, so the results give a clue as to how the trade-offs may have shaped our evolution. The paper is recently published in the Journal of Experimental Biology,. "Humans are also creatures that employ both endurance-based and aggression-based behaviors, so the results give a clue as to how the trade-offs may have shaped our evolution." Humans developed the ambush, a tactic wildly successful in both hunting and fighting which are in essence the same thing. Superior runners were able to outflank the competition and lie in wait. An ambush throws the advantage to brains over brawn. An essential component is the ability to anticipate an opponents movements. Goodall described apes ambushing enemies. But with humans the art of the ambush, as well as escape and evasion, escalated rapidly, requiring bigger brains and greater mobility, ultimately culminating in the cavalry.